This morning, Officer Minoggio of the Hualapai Police (the Eyes of Arizona) stopped by once again to say hello. Frankly, I’m happy to be an object of his concern for my safety and wellbeing. He had a favor to ask me, and I complied. When I introduced myself, the Chief knew exactly who I was, which was strangely reassuring. I proceeded to tell him how I felt about Officers Goins and Minoggio—two good men who are sensitive and caring professionals in one of the toughest lines of work there is. Chief Francis E. Bradley, Sr. was sincerely appreciative to get positive feedback about his officers, and told me he too plans to follow my progress. I felt good about making that phone call. The sun was out and it was warm. Seligman is one place on Old Route 66 that seems to be doing okay as a quaint tourist town. That said, other than an updated bathroom, a microwave, and a mini fridge, my room at the Supai Motel can’t look much different than it did before I-40 created ghost towns overnight and changed things forever. As my tent and other items were drying on a clothesline in the sun in the backyard of the motel, I walked to the General Store for lunch (egg salad sandwich and an apple), and then the Dollar General for a few absolutely necessary supplies (Oreos and M&Ms). 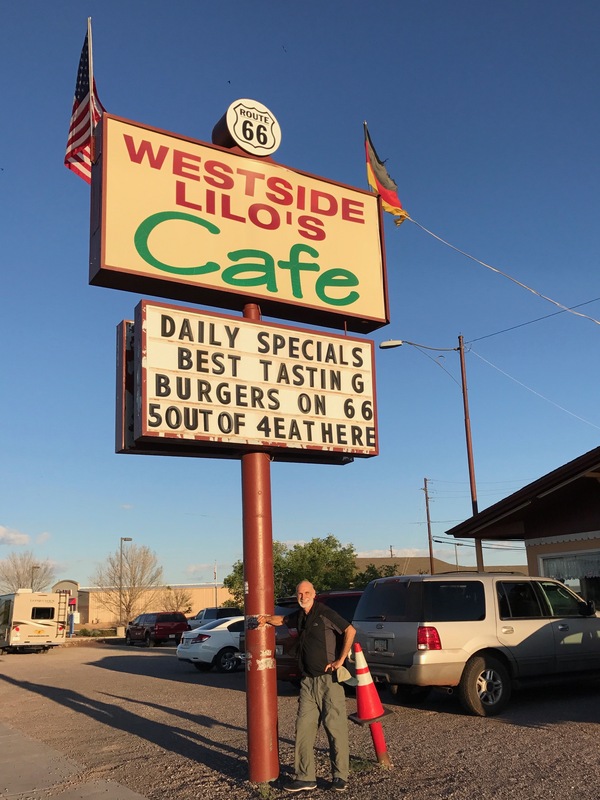 Dinner tonight was at Westside Lilo’s. I plan an early start tomorrow morning toward Ash Fork. Even though I only did 17 miles today, they were difficult miles.